Kulich (кулич) Easter Bread (Paska) is a Russian and Ukrainian festive bread baked at Easter, and is traditionally eaten only on Easter Sunday. The Kulich is a symbol of the atonement of Christ on the cross. The frosted top of the bread drizzles down, which reminds us of Christ’s crown of thorns. Sometimes you will find the letters XB which are the Russian initials for Христос воскрес (Christ is Risen). This next part might be a bit confusing. This sweet bread has 2 names, it’s called Paska in the southern Russia and Ukraine but it’s called Kulich in central Russia and the rest of Russia. It’s a popular Russian and Orthodox Easter Bread with roots in the Byzantine empire. This is not to be confused with another festive Easter cheesecake called Paskha (Пасха), which is made with Farmers Cheese. Now to make this even more confusing, Paskha (Пасха) is how you say the word ‘Easter’ in Russian. So you can eat Paska (bread), or eat Paskha (cheesecake), all during the Paskha (Easter) festive season. Now that I’ve thoroughly confused everyone, I’ll call my recipe Kulich, which is also Paska. Ok, I’ll stop! Traditionally Paskha Russian Cheesecake is spread on a piece of Kulich and is eaten together, for the real Russian/Ukrainian Easter experience (my Paskha recipe is made with white chocolate and macadamia nuts and is so delicious!). 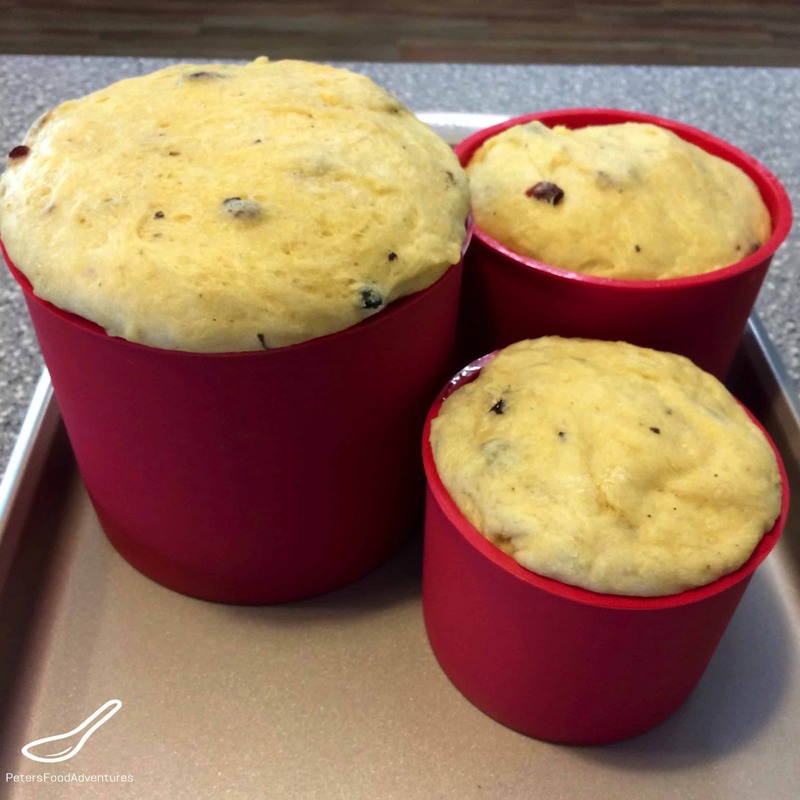 Kulich is a sweet, yeast risen dough, containing dried fruit (raisins), almonds, candied fruit, and spices (saffron, cardamom, nutmeg, vanilla). Depending on your taste preferences, you can vary the flavours, I like plain vanilla. All my yeast dough recipes are prepared in a Bread Maker using the dough setting. I like to avoid the manual kneading and rising of dough, I just want things easier. The Bread Machine does all the hard work for me, making the dough ready to bake. I use a fan forced oven, so the tops seem to turn golden brown quickly, but I just cover with foil and keep baking until the inside is baked. Because this is yeast dough, the height can collapse, so be careful not to slam any doors, until it’s baking and set. I’ve never been a huge fan of the traditional raisins in Kulich. Instead I used a mixture of raisins, dried cranberries and dried blueberries, which I think is so much tastier than plain raisins. 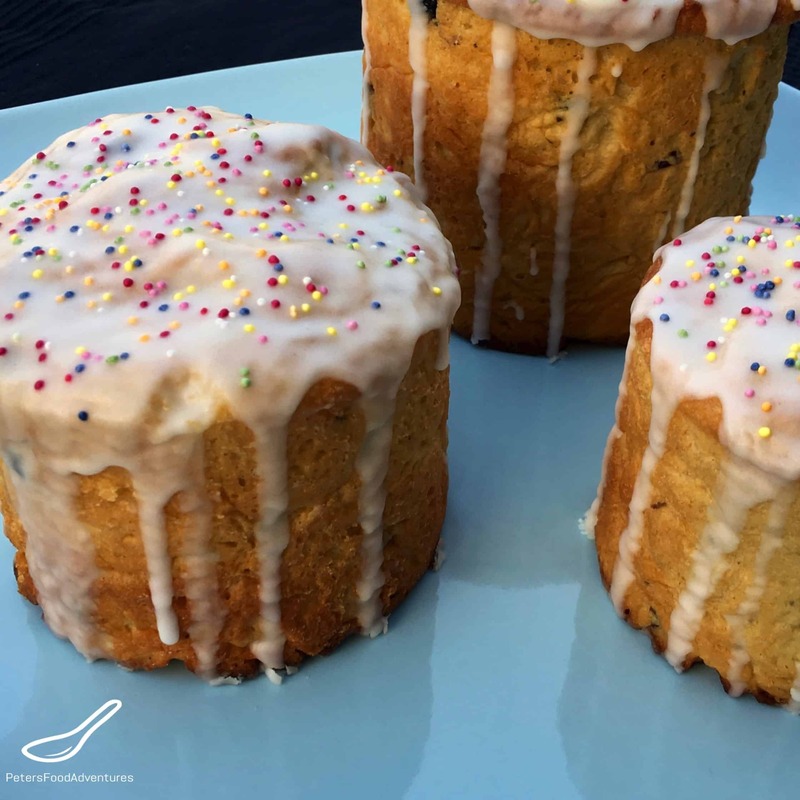 Kulich is always baked in a cylindrical shape, quite often you can use a tin can from coffee, or even pineapple juice tin. I found non-stick silicone molds on Amazon, which are easy to use. I’ve heard of some people use a panettone paper mould to bake Kulich. 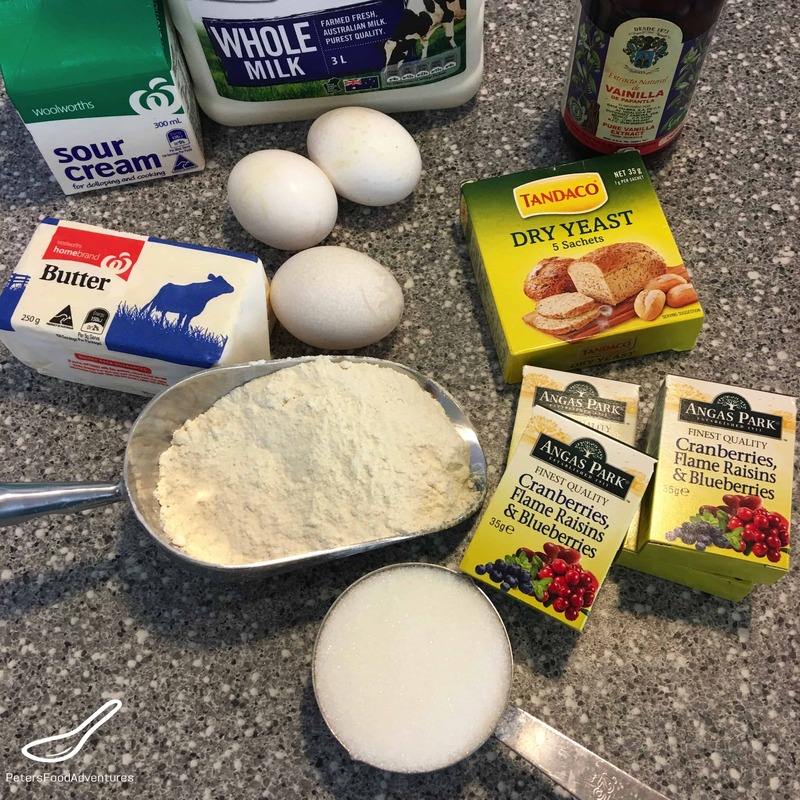 This is a delicious Easter Bread tradition, and if you have leftover Easter bread, you could make an awesome Bread n Butter pudding (but we rarely get there)! Everyone thinks that their Kulich recipe is the best, I hope you enjoy mine. Bon Appetit! Приятного аппетита! Remove the dough onto a floured surface. It will be very sticky. When you knock down the dough, to make it less sticky, add about 1/2 cup of flour and lightly work the dough. You don't want to properly knead it, but really just to keep it from sticking to the table. Grease the cans/silicone cylinder with cooking spray. Divide the dough, so that the can/cylinder is filled only 1/3-1/2 from the top with dough (it will rise the rest of the way). Cover with cling wrap and a tea towel, place in a warm place for 1-2 hours, and allow to rise to the top of the cylinder. Be very careful not to bump, slam doors, and even keep away from drafts. This can cause the Kulich to collapse. Place into a 180°C/350F preheated oven and bake from 20-30 minutes, depending on the size of your container. If the top is starts to burn, cover with foil and continue to cook. Using a thin wooden skewer, pierce the Kulich, and remove the skewer to test if it is done. If dough sticks on skewer, keep in oven for 5 more minutes and check again. Allow to cool on a baking rack. When it is room temperature, Mix the icing sugar, milk and vanilla together. Pour the glaze over the Kulich and top with colourful candy sprinkles. Thanks! Sometimes it’s hard to keep all the terms sorted! I love Easter time! ???? Bestill my beating heart! My great grandfather brought this tradition over from Russia. Do you have pelmeni and piroshki on here somewhere? Hi Carmen, thanks for checking it out! Don’t have traditional pelmeni yet, only one using a mold, but have a great bread maker piroshki dough recipe!